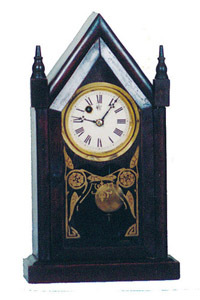 Waterbury Clock Co. "Small Gothic Extra", ca 1881. 15 inch mahogany case, no finial tips, good old glass, full label, beveled trim around the glass, new paper dial. One day movement, time only, runs and runs. Note the winding arbor at 10:30, pendulum swings off center. Ly-Waterbury No.1486.